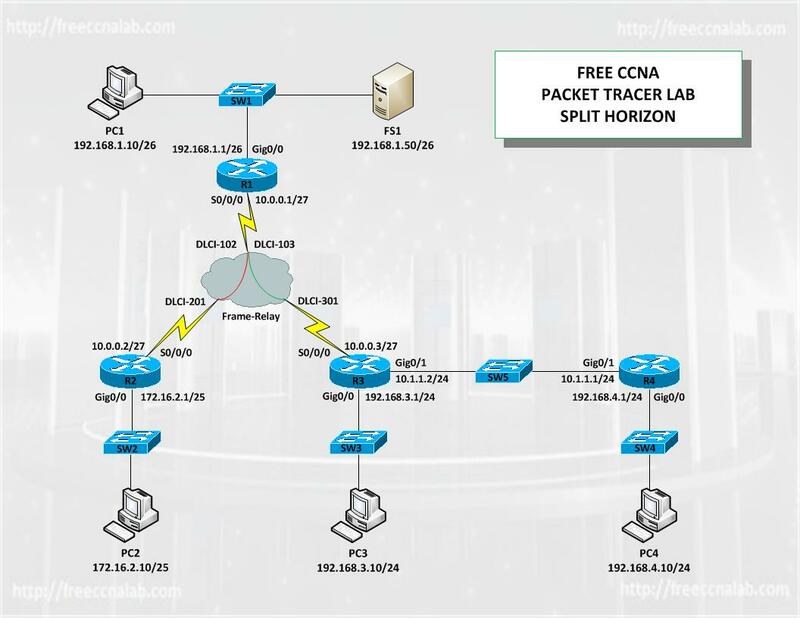 This CCNA Packet Tracer lab has been provided to help you gain a better understanding Split Horizon and how to configure it on a Cisco IOS router in a typical hub and spoke topology. Configuring and troubleshooting Split Horizon by default is a essential topic when preparing for the CCNA exam and as a Cisco network engineer, you will also be expected to know how to use Split Horizon when configuring Cisco networks or troubleshooting network issues. Distance Vector routing protocol, such as RIP, IGRP and EIGRP uses Split Horizon to prevent routing loops. Split Horizon mandates that the routing protocol will not send updates back out the same interface on which they were received. The split Horizon protocol permits a router to transmit routing updates in forward direction and propagates to all the attached routers, except that router which sent the new update. This method prevents routing loops and also sublimates those areas, where Route Poisoning cannot avoid routing loops to occur. This method is integrated in most of the distance vector routing protocols including RIP, IGRP, EIGRP and VPLS. The latest versions of Cisco IOS software, Split Horizon is disabled by default for Frame Relay and SMDS. However, older Cisco IOS software may have Split Horizon enabled by default. In the lab we will use Packet Tracer to model a simple hub and spoke Frame-Relay topology consisting 4 routers. We will use this topology to demonstrate how routing loop occur and how to use split horizon to prevent these routing loops. Although this lab has been created using Cisco’s Packet Tracer the lab can be completed using GNS3 or real hardware, but you should keep in mind that depending on the model of the Cisco device being used you may be required to modify the configuration to take in account changes in the interface names. Also if real hardware is used a wan switch will be required for the frame-relay, a router with three or more serial interface can be configured as a frame-relay switch. Review hub and spoke frame relay configuration. How to use split horizon to prevent routing loops. Review verifying configuration using Cisco show commands.